Things have been a bit quiet here on the home front as Reuben has been frantically wrapping up his PhD, and Laurie has been knee-deep (sometimes literally!) in camera-trapping. But finally, after quite a bit of a lull, we now have a new project update to share with you! Laurie reports from the field. 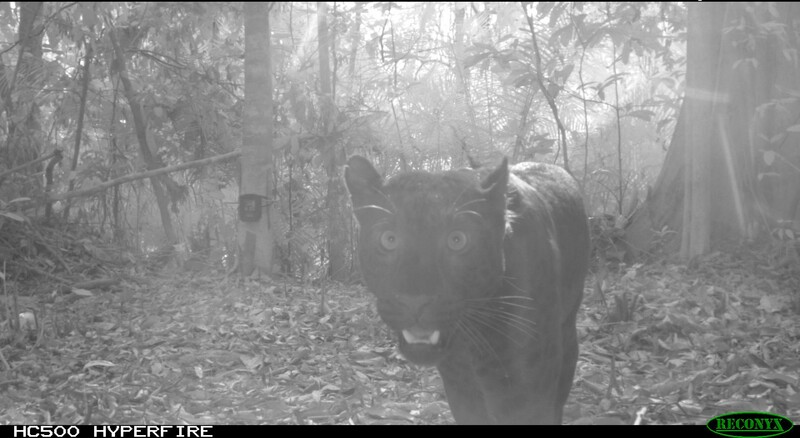 After trekking through the forests of Kenyir for the past month, all the camera traps have finally been visited, and the photos they have been quietly collecting for the past two months have been viewed in the first data retrieval for Project ‘Black Cloud’. The results could not have been more positive! Data from the cameras have reflected the impressive diversity of mammals that was first documented by Reuben’s study, which began in 2011 and finished earlier this year. Potential prey species for big cats, including Sambar Deer (Rusa unicolor), Gaur (Bos gaurus), Asian Tapir (Tapirus indicus), Wild Pig (Sus scrofa) and Barking Deer (Muntiacus muntjak) have all been detected from the cameras. 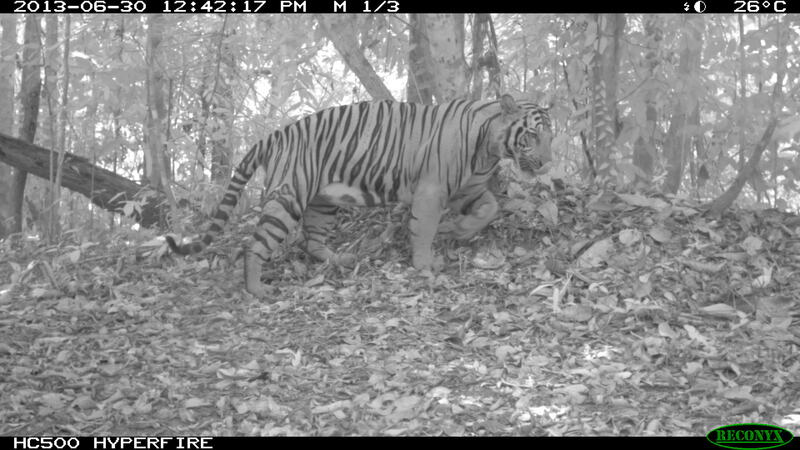 Rare and threatened species including Malayan Tiger (Panthera tigris jacksoni, Marbled Cat (Pardofelis marmorata), Asian Elephant (Elephas maximus), Serow (Capricornis sumatraensis) and even a pack of Wild Dogs (or Dhole; Cuon alpinus) – who were particularly interested in biting the cable locks of Laurie’s cameras – have all been captured. 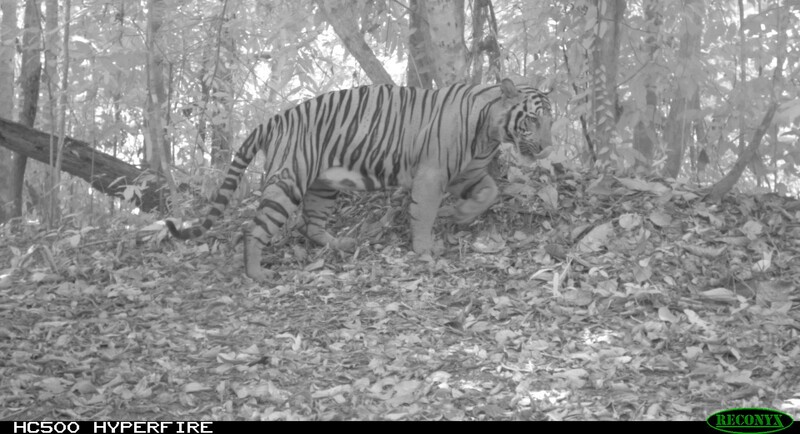 Even some fascinating glimpses of animal behaviour have been caught, including a series of shots of an adult and juvenile Golden Cat (Pardofelis temminckii) playing in front of a camera over several nights, and a King Cobra (Ophiophagus hannah) stalking and (maybe) striking at a Great Argus (Argusianus argus). Less positive is the number of detections and even encounters with people encroaching into the forest. So far the project team has met with two groups of people from Vietnam and Cambodia, who were camping in the forest looking for gaharu (agarwood; Aquilaria spp.). 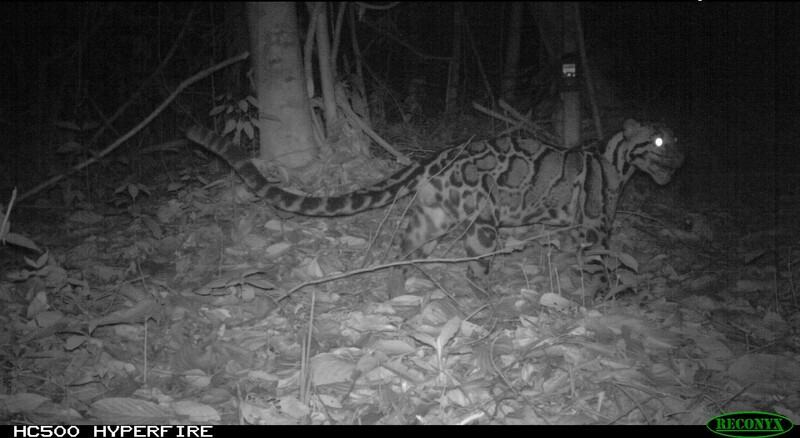 But aside from this, the real reason for covering Kenyir in a network of cameras has, of course, been to shed some much needed light on the two less understood big cats of Malaysia – the Leopard (Panthera pardus) and Clouded Leopard (Neofelis nebulosa). The results from this first round of camera-trapping have been incredible. From the first two months alone (there are four more to go) the team has managed to get 33 independent detections of Leopard and 25 of Clouded Leopard. After carefully examining each of the photos from these detections, Laurie and Wai Yee have managed to ID several individuals, with almost all having been recaptured at some point or another. There’s still a lot more data to collect over the coming months, but this first round gives us a lot of hope that we’ll be able to conduct a robust analysis of the data to improve our understanding of these cats. Preliminary insights reveal that at least some individuals of both these species are able to cross the highway that bisects the corridor, though it’s not clear how this potential barrier affects their activity and behaviour. So with all cameras having been reloaded with fresh batteries and memory cards, and in two cases having been replaced (due to an inquisitive elephant and an unidentified but desctructive animal) it’s time to make some headway with the arduous process of inputting all the data into the database. Excellent! Keep up the wonderful work… and update us as often as you can.